During my “off” week just after Thanksgiving, I picked up a pork loin and gave it the Chili Rubbed Pork treatment in my slow cooker. It made a TON of pulled pork, so I ended up popping a few portions of it in the freezer, one of which was destined to become this super easy 30 Minute Posole. 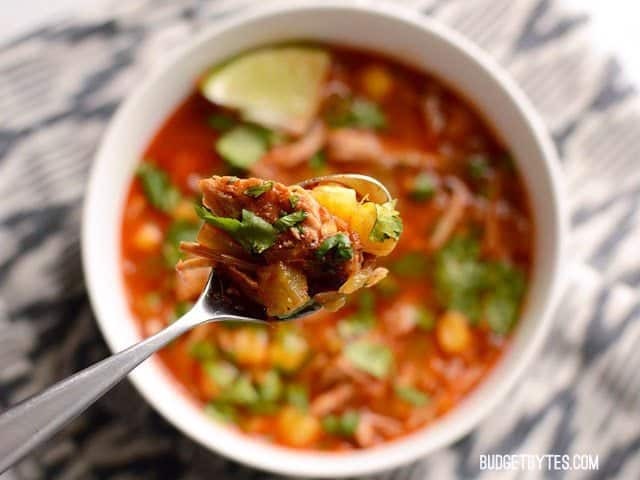 Posole is a rich stew, typically made with slow cooked pork, hominy, green chiles, and lots of delicious toppings. Using the leftover pork helped this recipe come together really fast, so this is a great way to take advantage of those leftovers on busy nights. Pork is the typical meat for posole, but if you have leftover chicken or beef I say why not go ahead and use that. I think it would be equally as delicious! 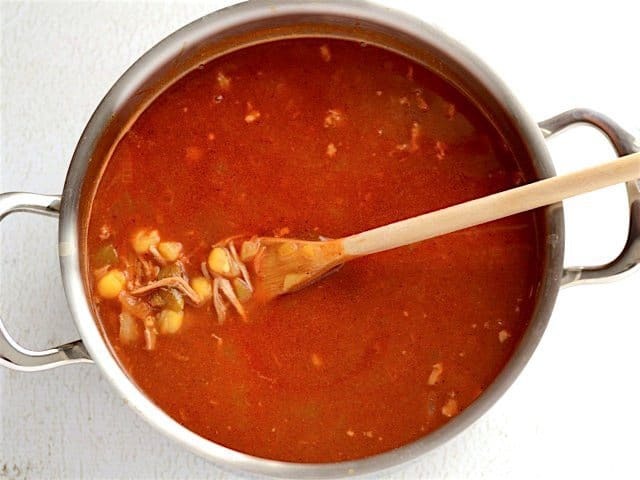 I used my homemade red enchilada sauce as a base for this soup, which helped thicken the broth and provide a TON of instant flavor. 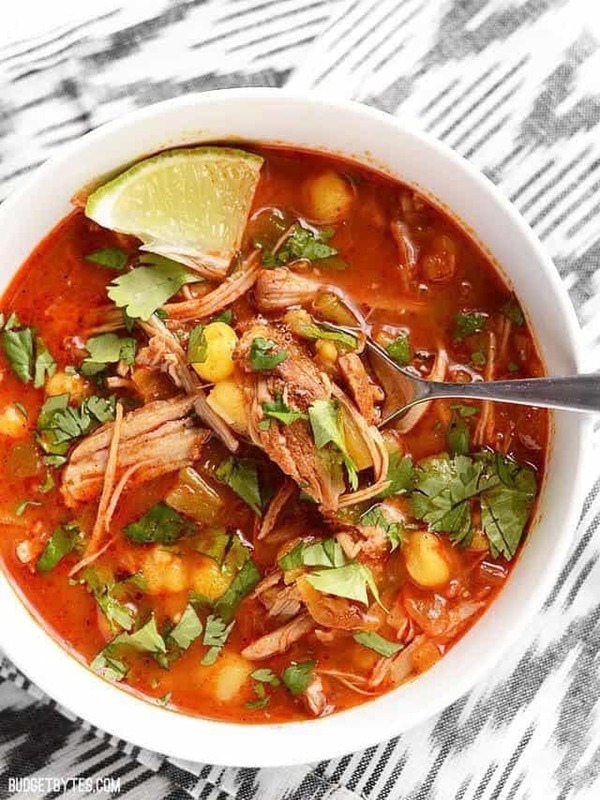 I kept the toppings for my posole simple to keep costs low, but if you want to splurge I think this soup would be awesome with a little shredded cheddar, pepper jack, sour cream, or avocado. The creaminess of any of those toppings would be an excellent contrast to the spicy broth. There’s a lot of room for customization with this one, so have fun with it! 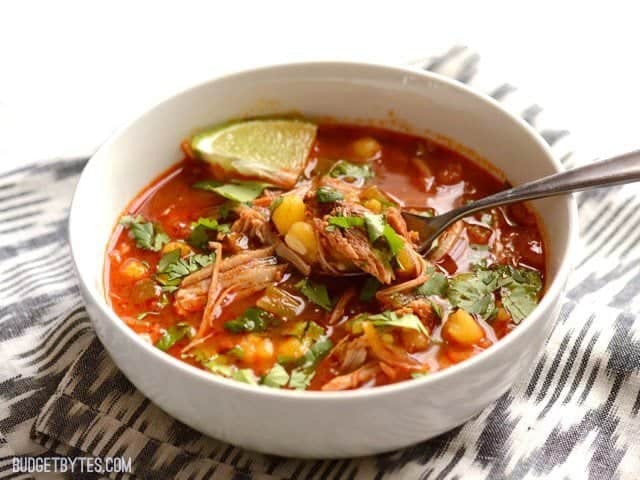 Use your leftover pulled pork and a quick homemade enchilada sauce to make this super fast and easy, intensely flavored 30 Minute Posole. *The chili powder used in this recipe is a mild blend of chile peppers and other spices, but does not include salt. **I use reconstituted Better Than Bouillon to make my broth. 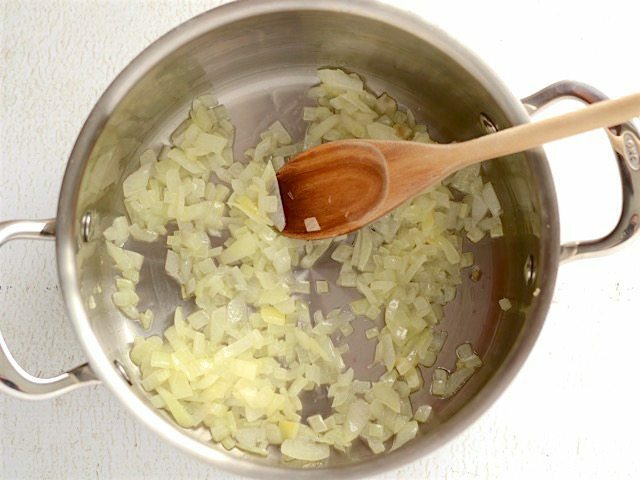 Begin by dicing one small yellow onion and adding it to a large soup pot along with 2 Tbsp vegetable or canola oil. 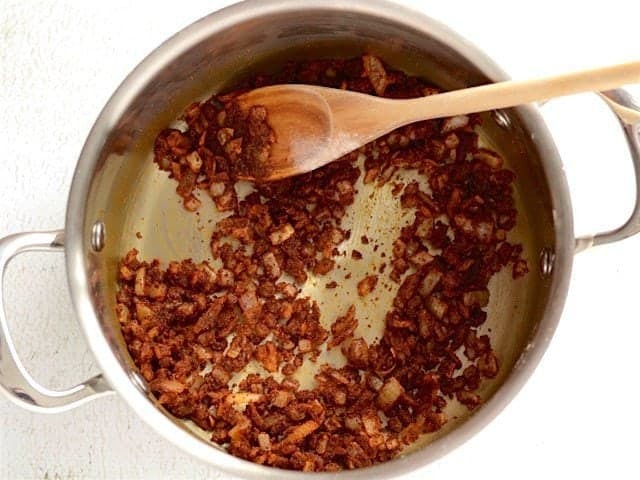 Sauté the onion in the oil over medium heat until it is soft and transparent. 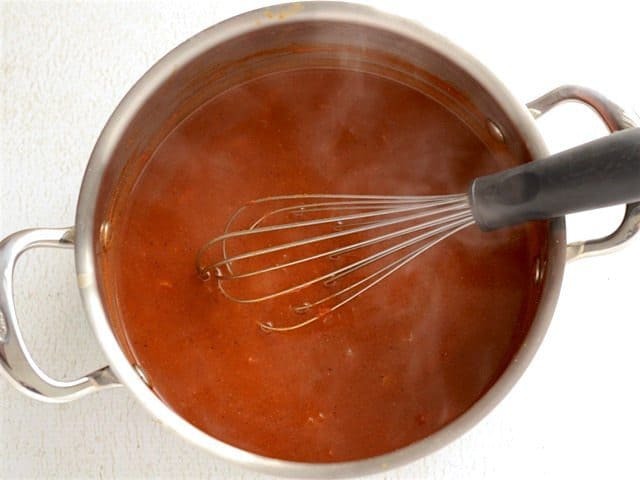 Although 2 Tbsp oil seems like more than needed sauté one small onion, that amount of oil is needed to make the roux in the next step, which provides the thickening power for the soup. Once the onion is soft, add 2 Tbsp flour and 2 Tbsp mild chili powder. Continue to sauté this mixture for two minutes to toast the flour and chili powder. It may be slightly dry, so stir continuously to prevent burning. Whisk in 2 cups water, 3oz. tomato paste (1/2 of a 6oz. can), 1/2 tsp cumin, 1/2 tsp garlic powder, 1/4 tsp cayenne pepper, and 3/4 tsp salt, until the tomato paste has completely dissolved. Allow the mixture to come to a simmer, at which point it will thicken. This is basically my Easy Red Enchilada Sauce (plus an onion). Drain one 15oz. 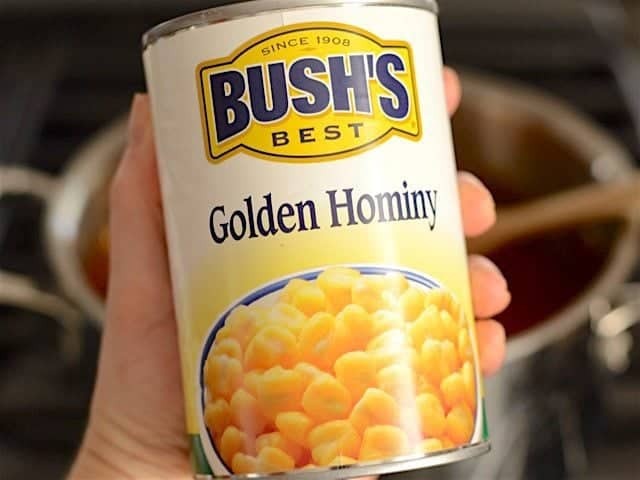 can of hominy (golden or white, your choice) and add it to the pot. Also add a 4oz. 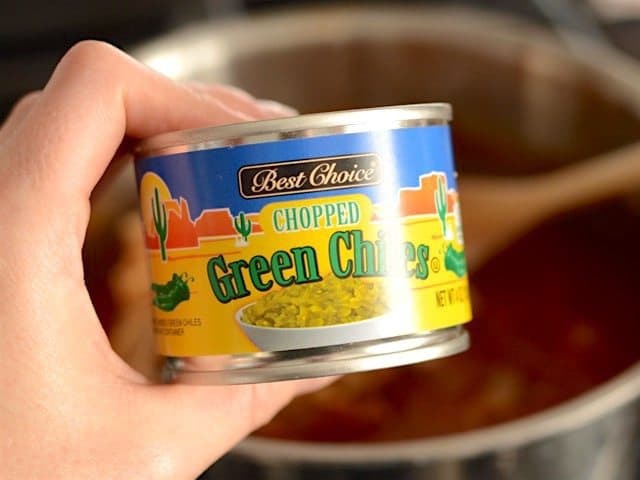 can of diced green chiles. And about 1.5 cups of pre-cooked, shredded meat (I used pork, but chicken or beef would also work). Finally, stir in 3 cups chicken broth and heat through. And that’s about it! 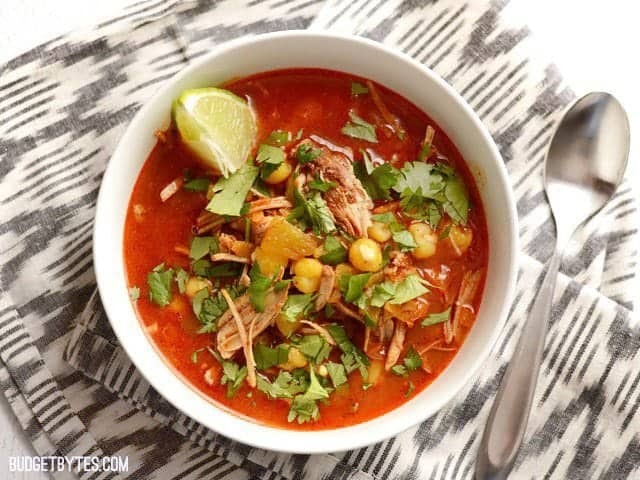 Really fast, really delicious 30 Minute Posole! Toppings are one of the most fun parts of posole, so I chopped up about 1/2 bunch cilantro and cut one fresh lime into wedges. The lime juice adds a really nice tart/fresh flavor to the broth. 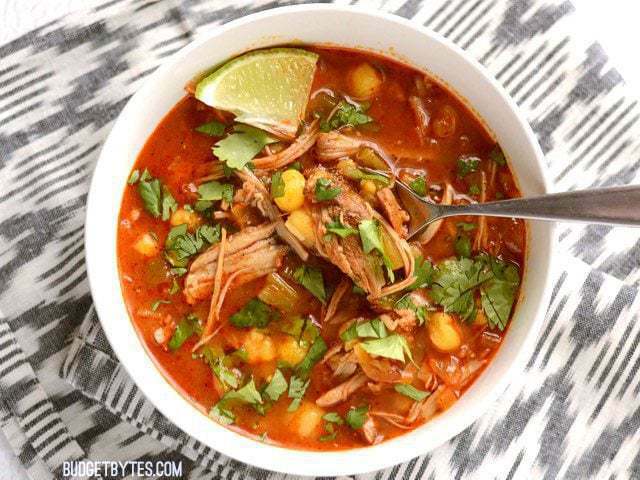 Top each bowl of the 30 Minute Posole with the chopped cilantro and a wedge of lime. Other fun toppings include: shredded cheese, avocado, sour cream, thinly sliced radishes, tortilla chips, or fresh salsa. And I’ll openly admit, this is my first time eating hominy. It’s DELICIOUS! It has that really nice corn flavor, but the big kernels have a an awesomely chewy texture. They are, without a doubt, my favorite part of this stew. Jeff- the recipe isn’t showing up because of your ad blocker (for some reason). The same thing happened to me. Hello, the recipe is not showing. I tried both Firefox and Chrome and I get the same result. Super yummy and oh so easy to make! I make mine with shredded pork and top it with shredded cabbage, lime, cilantro, and eat it with a tostada shell! Mmm..mmm.. good. This is a fabulous recipe!!! I made a huge triple batch, added pinto beans, and will be serving soon with avocado, cilantro, lime slices, sour creme and cheese. My teenage sons both sampled as I was cooking and both loved it. If there is any left over I hope it will freeze well for lunches. This is a fabulous recipe!!! I made a huge triple batch, added pinto beans, and will be serving soon with cilantro, lime slices, sour creme and cheese. This is delicious!!!! It tastes a little like the soup at Qdoba that I love. Used rotisserie chicken as well and it was so good. Will definitely make again! 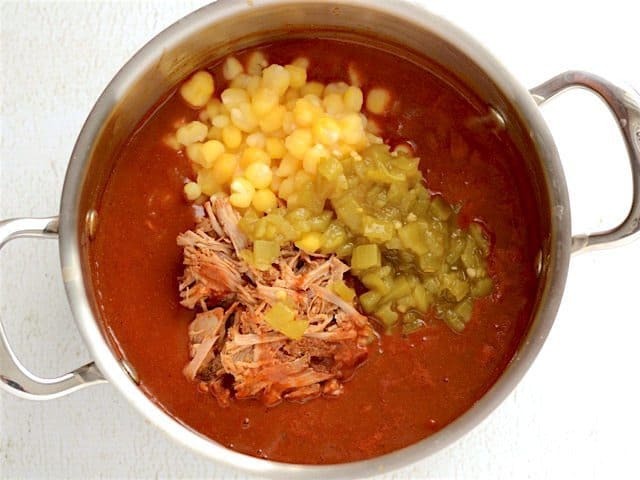 Can I make this recipe in a slow cooker and cook it longer? I’ve made this twice and it is SOOOOO good! It is a great way to use extra pulled pork that you might have on hand. I add a can of pinto beans. 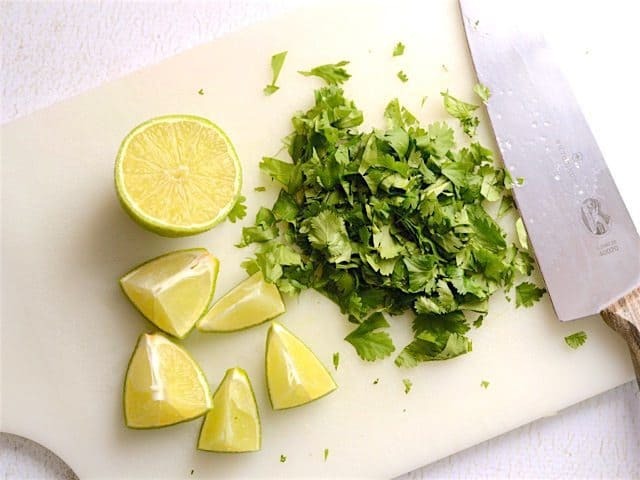 The fresh squeezed lime is a great way to top it! AWESOME, I used leftover shredded pork, i also used 1 tsp cumin ( i love cumin). I also used Knorr Chicken Caldo bullion! I wish someone was here to share it with!! This is delicious! I used leftover carnitas and followed the recipe exactly. I used a mild chili powder and my 7-year old son said he loved the broth. Coming from him that’s a big deal! Making it now in the crock pot. Used rotisserie chicken and won’t add the hominy til the last 30 minutes. Doubled the recipe for leftovers. Smells yummy, cannot wait!!! 5 stars in advance. Still currently eating it – second serving in. Delicious!! Adding this to my monthly meals!